Induron Protective Coatings formulates and manufactures high-performance coatings for the electric power industry. The company specializes in maintenance coatings for the high-voltage electrical transmission tower and pole structures, as well as substation structures and equipment, both above and below-grade. Because traditional methods of abrasive blasting and spray application are logistically very difficult and costly, Induron has developed an extremely low-cost method of providing minimal surface preparation. You simply apply one or two coats of specially designed coatings that tolerate old coatings, weathered galvanized and carbon steel, and rust. In fact, if weathered galvanized above-grade material is coated within the ideal window of opportunity, it can often be protected for 20-25 years with one coat of very low volatile organic compounds (VOC) sustainable barrier coating, #9200 Induraguard™. Induron will also help you survey your transmission and distribution (T&D) system. We provide a maintenance programme to rank and prioritize all of your structures and equipment. We also help scrutinize the severity of the environment where your T&D assets are exposed. Induron uses specifications and standards developed by international organizations such as ISO, NACE, IEEE, SSPC, and ASTM. Our quality process provides a superior method of grading, ranking, prioritizing, and maintaining a T&D system protected against corrosion. Our process also provides the lowest possible cost per square foot per year of coatings protection. At Induron, we recommend only the very best applicators to provide this physically difficult and dangerous task. We suggest that you require levels of certification in electrical safely, climbing, and competence when awarding these coatings projects. 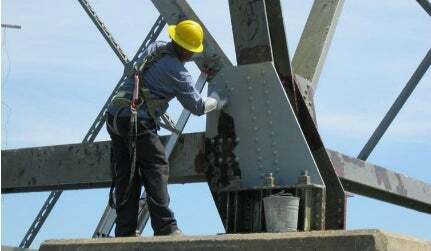 Specialized sub-categories of these coating services include flow-coating, tower footing repair and coating, paint mitt and brush application. Induron manufactures a full line of maintenance coatings and linings for power plants, especially for cost-effective coatings of structural steel, equipment, concrete floors, and tanks. Because traditional methods of abrasive blasting and spray application are logistically very difficult and costly, Induron has developed an extremely low-cost method of providing minimal surface preparation. Induron Protective Coatings, an industrial pioneer of ceramic epoxy coatings for high-performance systems and potable water immersion, has announced that it has created an InduraPlan programme for customers of the transmission and distribution (T&D) industry. Induron Protective Coatings has revealed that its high-quality PE-70 industrial epoxy coating complies with the California Air Resource Board (CARB) limit for volatile organic compounds of less than 250g/l. Induron Coatings has launched Induratar, a new single-component, moisture-cured coal tar urethane coating fortified with micaceous iron oxide. Induron Protective Coatings has announced it has appointed Kent Kuehl and Carl Moye to its sales and service team. Induron Protective Coatings has expanded its production facility in Birmingham, Alabama, US.